Oh my goodness Lovelies, we are smitten over this garden moss tablescape for today’s inspiration! How lovely are those vintage tool boxes overflowing with blooms used as centerpieces? We also love all of the vintage cups and goblets to hold individual blooms too. Did you notice the mini mushrooms too? Love those! The craft paper favors on each place setting are darling too. 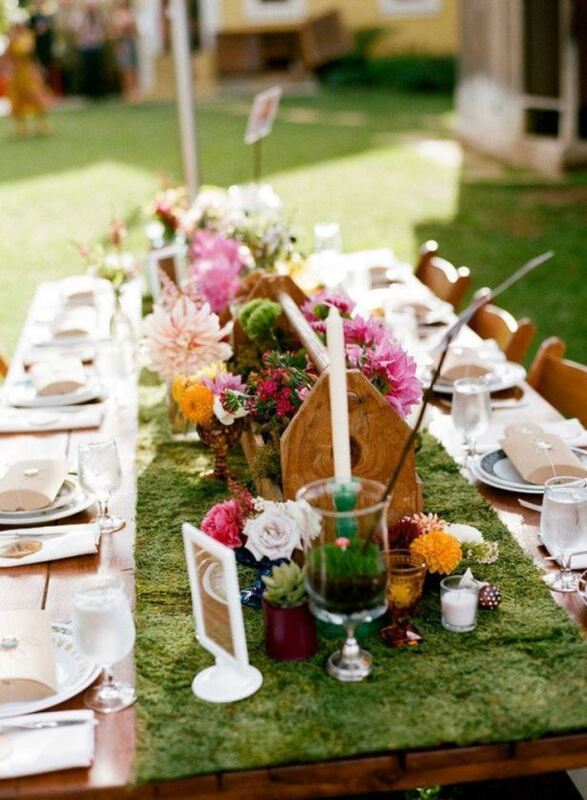 We love the warm wooden table and matching chairs to really bring a romantic garden feel to this outdoor tablescape. The moss runner just brings this garden tablescape to life. Almost like we are in the middle of a forest, sitting down for a nice meal.